So open’s the new album “Cuz” from Niamh Ní Charrra. 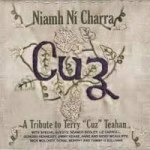 The track is an archive snippet from the late Terry “Cuz” Teahan, writes Seán Laffey. Annascaul can be translated as the River of the Heroes, it was the birth place of one of Ireland’s most unsung sons, Tom Crean, artic explorer and Irish hero of the Scott and Shackleton expeditions from 1900 -1914. Castlemaine is a little further north, it had a railway station for 75 years until it was closed in 1960. Those dates frame the world in which Cuz Teehan worked musically. Even though he was to spend the majority of his adult life in Chicago, his world could be encompassed on that rail journey through the Kingdom of Kerry. And that bit of doggerel, like a great deal of Teahan’s work holds a weightier, more melancholic meaning when you begin to dig a little deeper. 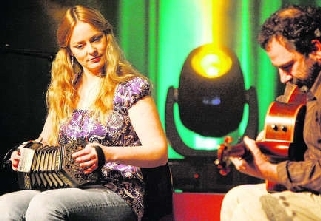 Teahan’s music has been more or less known for forty or more years now, it belongs to the Sliabh Luachra tradition, and it has influenced some of Chicago’s finest players , Liz Carroll and Jimmy Keane would be the first to acknowledge the debt Irish music in the mid-west owes to the teaching, and energy of Teahan. Yet in Ireland, although his name is well known, and we would have tunes that we suspect were by him, there was nothing much that was a tangible legacy. That is until Niamh Ní Charrra decided to create a tribute album to one of her musical heroes. Once out in the wide world tribute flooded in for her scholarship, the sheer exuberance of the ensemble playing and her tenacity in chasing down each element of the project. The Chicago Connection wrote: "This is the immediate front runner for Album of the Year." Chicago Irish American News 03/2013: "“Cuz” and the recognition this brings to Mr. Teahan is long overdue. Thank goodness, the woman who pulled all this together is a stunningly gifted musician and archivist." "This is one of the best. Ever. Good on Cuz, and good on Niamh!" Said American Public Radio. 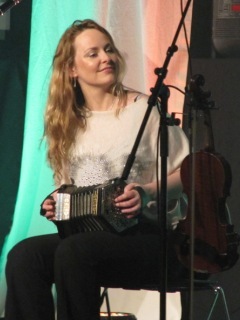 It was the Sunday night at the Gathering Festival in Killarney’s Glenaeagle Hotel and I had the great pleasure of interviewing Niamh Ní Charra, She was just back from an extensive tour with Riverdance in China, looking remarkably relaxed and fresh, remarkable because the past 12 months had been non-stop for the concertina player and fiddle player from Kerry. Here’s the story. Terry Cuz Teahan was born in Cordal Glountane County Kerry in 1905. He took up the concertina and single row melodeon, he played fiddle too. He was a pupil of Padraig O’Keefe and by the age of 23 was an accomplished player. At that stage, in 1928, he took the emigrant boat to the USA and settled in Chicago. Life was tough at first; work was difficult to find and to eke out a living he made embroidery pictures, in a Victorian style, which he would sell to members of the Irish community. Eventually he got a job with a transportation company and worked in the Chicago rail yards. He was hugely influential in the Irish scene in Chicago; he played for dances and was a well-respected teacher. He was active for sixty years there and his habit of getting a fellow musician a job by saying they were his cousin, earned him the nickname Cuz. There is only one commercial recording of his work we know of, Old Time Irish Music in America -Terry Teahan and Gene Kelly, this can be found on Topic Records 12TS352 (LP, UK, 1977). The album is made up from two recording sessions, both by Mick Moloney, one of the accordion player Gene Kelly that was captured on 17 July 1976 in Washington and the Terry Teahan selection, which Moloney recorded on the 28th of July 1976 in Chicago. Now 37 years later, Niamh’s album Cuz brings Teahan’s music to a new generation of players, puts it back in the hands of some of the finest musicians in Kerry and weaves in spoken word and doggerel introductions to the tunes. Niamh tells me that back in 1986 Teahan was on a return visit to Kerry and he met up with her, at the time she was only in primary school, but was already a gifted player, he correctly predicted she would one day be an All Ireland champion and he gave her a tape of his music. I wondered if there were any more of those tapes still around? “I’m sure there are, I wasn’t the only young player he sent cassettes to, he was keen to pass on the tradition and I know he’d make tapes for youngsters who came to the US on the CCÉ concert tours for example. I suppose he got lucky with me, in that I’m from Kerry and the tunes were here already and his new stuff fitted in perfectly to our tradition. In fact he came back often enough to make a living contribution to the Sliabh Luachra repertoire. I often wonder if he had given the same sort of tapes to players from say Clare or Sligo, maybe they wouldn’t have appreciated them as much as we do here? Maybe this album will bring out a few more C90s from old drawers and boxes in attics”. That scholarship is evident in the liner notes which run to 22 pages. Niamh says the work is worthy of such detailed notes but reflects that it’s not always possible for own label albums to be so detailed. There’s a cost involved in printing, and it can be more than the production costs of the album itself, so for players on a tight budget she can see why they keep the information to a minimum. Niamh was helped by grant aid from The Arts Council’s Traditional Arts Funding. and from Fund It, the crowd funding system. I wondered if the use of social media funding was a way to go for budding players who might be ready to make a debut album? The album is full of great music of course, played by some of the finest traditional musicians in Sliabh Luachra at the moment: Donogh Hennessy, Seamus Begley. Mick Moloney and Tommy Sullivan. With two tracks recorded in Chicago. Those of you who know Sliabh Luachra music will be delighted with the joy and lift in the tracks that are presented here, those who are yet to discover this dance music from the South West of Ireland are in for a real treat. This is a must for any collection, you can take it as great fun, a work of scholarship but above all it’s a legacy to one of the greats of Irish music, Terry Cuz Teahan, a man of many talents and an 8 year old girl who got a gift of a C90 tape in 1986. Photo Credits: (1)-(4) Niamh Ní Charra (unknown).